In the midst of decorating our new home for the fall season, I thought I’d revisit the quilling paper acorns that I had made a few weeks back and see where I could take them. I played around for a while and … AHA! DIY paper acorn garland! Then I just had to figure out how to make it work. I realized pretty early on that the little, tiny acorn caps that I found in our backyard, while great for scattering paper acorns across a table or in a bowl, were just too small for garland purposes. They just wouldn’t really stand out. Luckily, Mr. Craftery came through. He found some huge acorn caps under a tree outside of his work, and gathered a bunch up on a break one day. What a guy! First thing’s first: gather supplies. Because I wanted my paper acorn garland to have a rustic, country look, I chose to use burlap twine as my string. I also needed, my acorn caps, scissors, white glue, my quilling tool, paper strips, and a way to make holes in my acorn caps. Make sure those caps are clean, and there is no unexpected crawling visitors hiding inside! Yikes! I just clean mine with soapy water. Next came the tricky part: how to put holes in the acorn caps. I wanted to tie the acorns to the garland twine with bows. For my first try, I attempted to hammer holes in cap over wooden board, using a large nail, but this caused the acorns to snap in two. It was not going to work. So I resorted to power tools. I held the acorn cap with pliers and drilled 2 small holes on either side of the stem of the cap. TIP: Drill at your own risk! With such a small surface area, it is easy to have an accident when drilling! Please use all safety precautions, and wear work gloves and protective eye wear. The Papery Craftery is not responsible for any finger injuries, so be safe, people! I would only drill into large acorn caps, larger than one inch. The small ones would be a recipe for a hand injury! If you’re nervous about drilling, you could always use a dab of strong, white glue in the top of the acorn cap to adhere the twine and make a bow with that. I did try hot glue too, but I’m kind of a mess when it comes to that. Once all the holes are drilled, cut 6″-8″ lengths of burlap twine, enough for each acorn. Pull ends of twine through holes in acorn cap so the ends are towards the top of the cap. Make Quill acorns, as shown in the original quilling paper acorn tutorial. I stuck with a more traditional autumn color palette for these acorns, and chose a deep leaf green, ivory, and crimson, plus my current obsession, copper! Because I used really large acorn caps for this garland, I needed to roll about 100″ or so of quilling paper per acorn. This garland will devour some paper, but I think it is worth it! When your acorns are dry, tie them in bows about 5 inches apart along a long length of twine, and your garland is ready to show off! Maybe you could hang it over a mirror or a chair or across a window. For the really ambitious, string it around your Christmas tree! That would be a show-stopper! 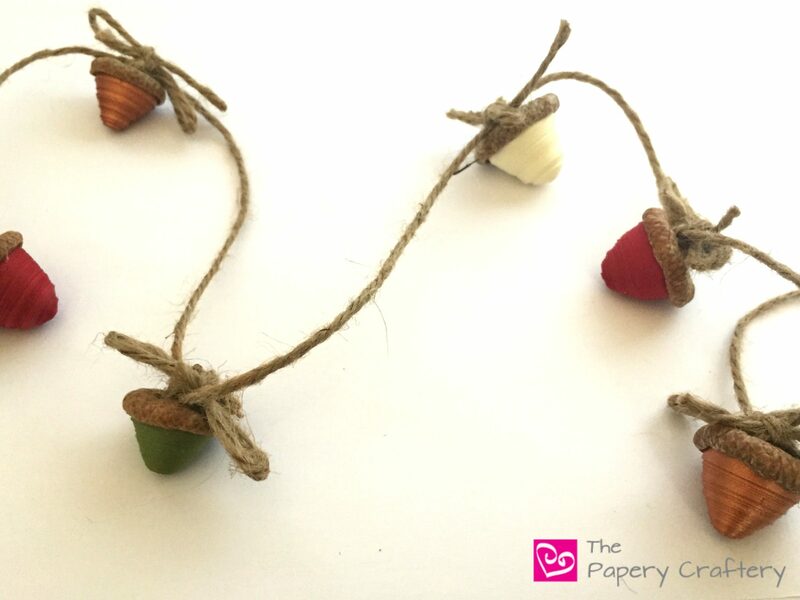 I’d love to hear how you used your DIY paper acorn garland! Drop me a comment below and tell me all about how you’re inspired to use your garland! This is so fun! I love these sweet little acorns! I’ll have to try it! Awesome, Jamie! I’d love to hear how it goes if you give it a try! This garland is adorable! I would have never guessed you made them out of paper! Thanks so much, Naomi! Paper does amazing things!